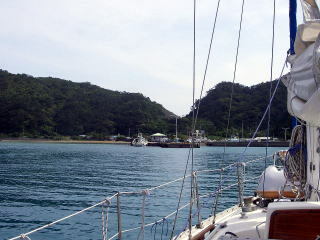 Ikenma is a picturesque place in Kakeroma-jima island on the opposite shore of Koniya. It is 2.4 nm away from Koniya and has ferry services. I recommend your visit by boat. Shodon is 30 minutes walk away. 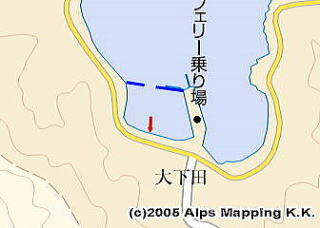 Berth: Move between small breakwaters to enter the port. Then, moor your boat bow-to at the quay on your front. You may stay here for a few days. 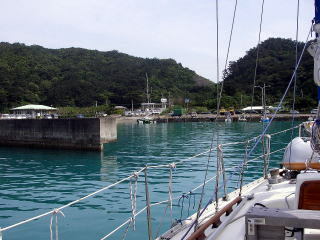 When I approached first time, I tried to tie up at the back of the breakwater on the left. But, a man on shore waving his hand showed me the front quay to moor. He was a French guy living here for years and doing maintenance work on his 36ft boat. the boat will be sucked into there at ebb tide and broken. There are water, toilet and a restaurant at the ferry landing place. I didn’t confirm though, people say a food shop is also there. I saw two always-mooring local boats there. 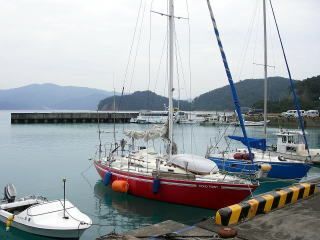 In 2006 autumn, I also saw two long-stay big foreign boats inside of the outer breakwater.